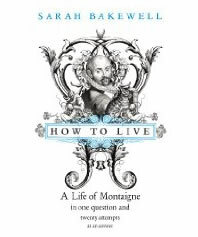 This was an entertaining read which may encourage people to read Montaigne. It is, however, very different to other biographies I have read over the last few years. The most notable being Joseph Frank’s multiple volume biography of Dostoevsky which fuses his life with detailed literary criticism as Frank believes that they should not be separated. Compared with Frank, Mirsky’s Pushkin or Kelly’s Lermontov this seemed a little light. It was enjoyable but I didn’t really feel that I got to the substance of the Montaigne. Admittedly, part of the reason for this could be that the biographies I mentioned above were based on 19th century writers rather than a Montaigne of the 16th century with less biographical information available. The stucture was interesting, with each chapter’s theme being a question that could have been posed by Montaigne and the answer then given via biographical details with a nod to his writings. So, to sum up, worth reading and not too challenging. To get more flesh on the bones the reader will just have to read Montaigne. Soundtrack: Calling Zero – ‘Lifetime for the Mavericks’.